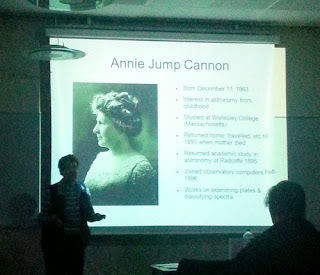 On Thursday night, Maggie Collins gave us a very interesting talk on "Harvard's lady computers - the women who classified the stars"
These ladies were working in the late 19th century and early 20th century and included Annie Cannon and Henrietta Leavitt. Henrietta Leavitt went on to discover Cepheid variables which are one of the main "standard candles" for calculating distance to very distant stars. Maggie was rudely interrupted by the fire alarm just before the end of the talk, but luckily not before we had learnt about these ladies who were pioneers in a male-dominated field. Thank you Maggie! Also thank you to Howard who told us about some forthcoming Spring astronomical events to watch out for.